Watch the thunder crash on the front of Dark Knight Returns, see Tony Stark get the shakes in Demon in a Bottle and Spider-Man drown in these animated comic book covers! Digital comic covers should do exclusive covers like this! Online shirt distribution store shirtoid.com created this version of Back to the Future‘s own Doc Brown befitting of any Japanese anime. Try imagining Doc screaming “1.21 gigawatts” in Japanese, you’re welcome. I love TARDIS builds and this one is no exception. It’s a full-size bookcase made in the form of a TARDIS. Amazing! Full credit to UK model-maker msmuse101 – with the help of her Dad – for making one of the coolest Doctor Who builds ever. 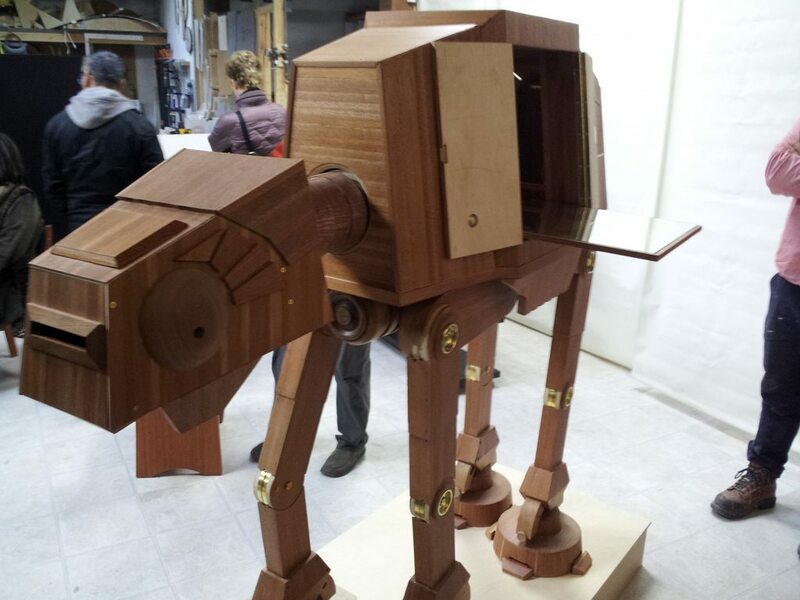 Here’s another classic case of something you never new you wanted – Custom AT-AT wood liquor cabinet…with fold out cocaine mirror (at least I think that’s what it’s for). Comics illustrator and video game enthusiast Bill Mudron illustrated a jaw dropping Game of Thrones poster ($20) inspired by Celtic illuminated manuscripts like The Book of Kells. Ever notice how all the spells in Harry Potter sound like items our good old buddy from Nintendo, the great Super Mario, would use? Yea, I never thought about it either, but it all makes sense now! This artwork depicts Metroid’s Samus Aran modeled with Gameboy, NES, Super NES, and Nintendo 64 cartridges. The power-ball option is nothing more than a cube. Comic Book artist and fellow Canadian Faith Hicks created this webcomic earlier last year about a young superhero as she handles everyday life, relationships, and giant kitten squid monsters. You couldn’t do this with Superman, but Faith blends comedy perfectly with super powers every Tuesday. The Simpsons have been around for over twenty seasons. Over the years there have been guest stars a plenty, but where the hell has Batman been? Dean Fraser and his site the Springfield Punx turned the heroes and villains of Batman: Arkham City into yellow, 2d characters. Dean does a fantastic job highlighting the details of the video game and giving everyone only four fingers. Take New York’s ghost hunting team the GhostBusters and flip them on their side with a dash of Dr. Seuss and you get the start of the best children book ever. Australian artist DrFaustusAU created this cover as a way to take a nice break from his other Dr.Suess parody “The Call of Cathulhu”, but this could be another hit for your child’s bed time story collection. That is, if he ever writes it. And finally we end this round up with…Doctor Who cyberwoman burlesque with power tools. If this isn’t art then I don’t want to live on this planet anymore.